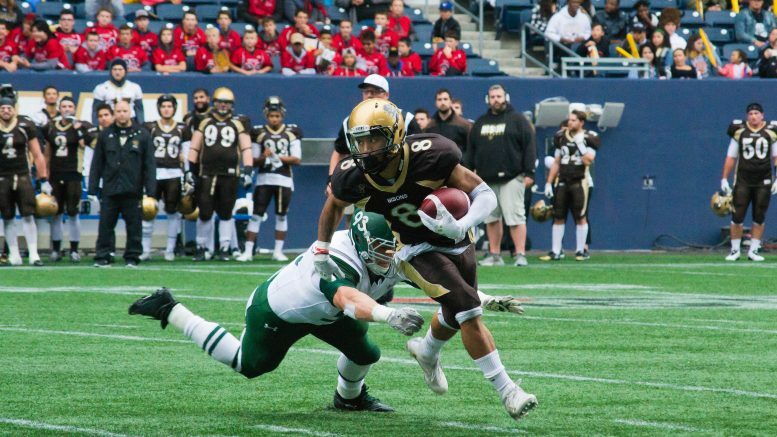 On Saturday, the University of Manitoba Bisons football team took on the eighth-ranked Saskatchewan Huskies in their 2016 homecoming game. The Bisons scored 25 unanswered points in the second half to take a resounding 38-17 win. The Huskies opened up the first quarter by trying to establish their run game, but with little success. On the Bisons’ first possession they went the opposite route with second year receiver Jesse Walker and Theo Deezar hooking up for a 65-yard catch. 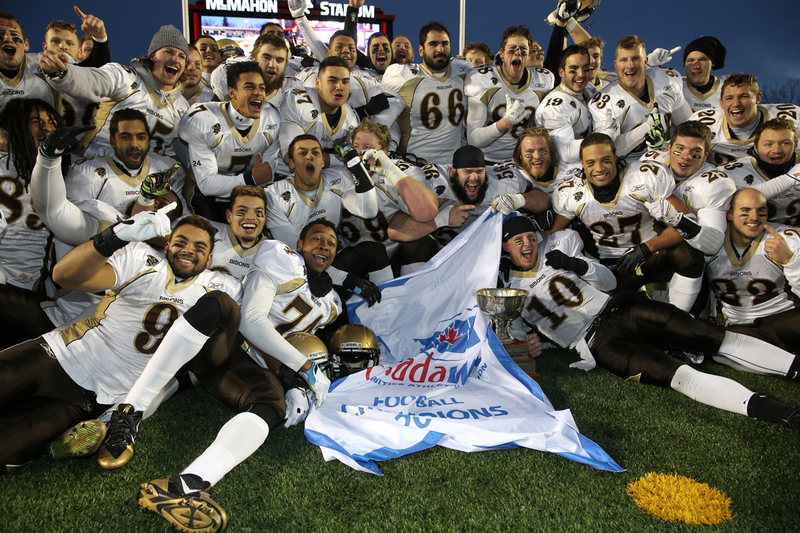 The Bisons eventually found the end zone with a one-yard catch from Macho Bockru – his first ever CIS touchdown. Saskatchewan opened up the second quarter with a 20-yard touchdown to Ben Getzlaf to make the score 14-7. The Bisons replied a few minutes later with a 36-yard field goal from Brady Mikoluff. The teams traded another pair of field goals towards the end of the half, with the Huskies holding a 17-13 lead at half time. On Manitoba’s first possession of the second half, Deezar and Shai Ross worked some magic. First the pair connected on a 44-yard pass to get the herd into the red zone. The next play Deezar found Ross in the end zone with a perfectly timed throw to make the score 20-17 for the Bisons. Ross had five catches for 113 yards and one touchdown on the day. The Bisons got back on the board at the end of the third quarter with a 12-yard field goal from Mikoluff. The Bisons started the fourth quarter with a lengthy drive, only to be stymied in the red zone after Deezar had his pass deflect off a Bison receiver and intercepted by Donovan Dale. The Bison defence shut the Huskies down on their ensuing drive, preventing the Huskies from capitalizing on the turnover. Manitoba’s defence did a great job on the day, forcing a lot of two-and-outs and registering four sacks. On their very next series, Deezar found Marquise Thompson for a five-yard touchdown. The herd would then go for the two-point conversion successfully to make the score 31-17. Deezar finished the day with 447 yards and three touchdowns, his fifth game where he has thrown over 400 yards in 12 CIS starts. Deezar was allowed to do this by the great protection from the Bison O-line, who have not allowed a sack against in four games. Alex Christie added another touchdown in garbage time to make it 38-17. Bisons head coach Brian Dobie talked postgame about the play of the herd in the second half. The now 2-2 Bisons head on the road on Sept. 30 to play the UBC Thunderbirds, the defending CIS champions.